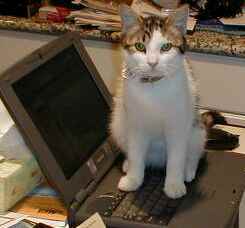 Friends of Math Cats have been sending in cat tales and other animal stories... scroll on down and read a few! (The links with white background have photos or drawings.) We'd love to see your stories, too. It is even better if you can include some math in your story. Read our cat tales, below. Visit our math story problems. Visit our other animal stories. Visit our number stories. Moonie Moo-Moo My Murderer Cat! I Love Cats! Charlie is his name and he is a tabby cat. Something he will never forget: he was abandoned and a lady found him then put him at the vets', he throws up when in the car. That last one is pretty disgusting! Throws up! He's even afraid of water! I wonder if he had some bad experiences with water like someone was trying to hose him down or something!!! Once there lived a tabby named Charlie. He had no home. He had to stand out in the rain begging for food. 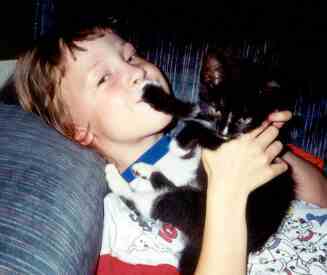 He was just a kitten. He had no collar! When there was a pause in the traffic, Charlie zoomed over to a barbershop. He was so hungry he could eat anything! Charlie went through the door while a lady was leaving. When he got through the door, a child said, "Kitty!" Charlie was frightened. A barber saw Charlie and picked him up. Charlie purred because he liked the man's petting. The barber whispered to him, "You go find your family." Charlie was amazed by the man's words. Charlie begged again. The barber gave Charlie some cat food. Charlie looked at the food wide-eyed. I bet if he could talk he would say, "Thank you." Then he ate the food. When he was done he looked outside; there was his family! They found him. They went inside to pick him up. Charlie found himself in a car and then home. Charlie's family gave him food. He licked the bowl clean. He finally had a family. Charlie decided he would be adventurous at home. And he was. They lived happily ever after. I have a lot of cats and more, because there are more cats in my yard that do not belong to me. And I have two little kittens named Snowball and Cupcakes. I changed Snowball's name to Snowtom because it likes snow and Tom. My cats' names are Lucky, Fluffy, Oddball, Scoobydoo, Tiger, and a lot more. My dog's name is Coco. She's a girl and Bobo is a boy and Coco is about to have some puppies. I had another cat name Cupcakes, but some dogs came and killed her, so I named another one Cupcakes when my cat name Goldberg had kittens. I was so sad when I found the dogs killed Cupcakes. That was 4 months ago, but I still miss her. And what makes it so sad is that I brought her in, but the most saddest thing is that sometimes I feel like it was my fault because I put her out and if I would have said no she would still be alive. ...Thanks for making me happy. I feel much better after I read the e-mail you sent me, and I know that it was not my fault. It was that mean old dog's fault for killing her and my dog's fault for letting him come over. She should have been watching Cupcakes. We took the girl dogs to the dog pound. My cat's name is Rastus. He has a fashionable two-tone coat--black but with a white undercoat. He has no pride of ancestry because we don't know what it is, but he is a proud cat. He likes to eat dry grass, come inside, complain bitterly about how he feels, then throw up on the carpet. I don't like that as much as he does. He hates going to the vet, even riding in the car to get there. He tried to get back into his cat carrier after they took his temperature. 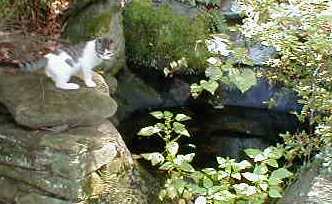 Rastus loves to watch fish. He thinks my aquarium is a big-screen kitty TV. Sometimes I use a computer screen saver with fish swimming around. I showed Rastus the screen saver and he was fascinated. He was absolutely convinced that there were fish in my monitor, since it was transparent and about the size of the aquarium downstairs. 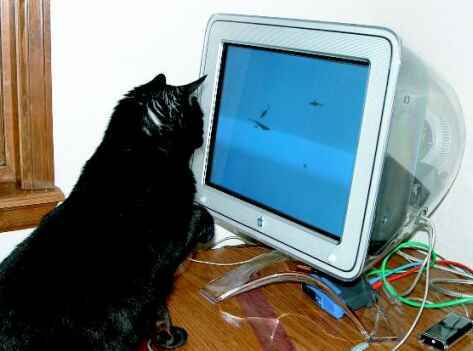 He poked at the screen and went around behind the monitor to look inside. I had to turn the computer off before he gave up the fish search. I have a cat. Her name is Sugar. She is white. That's why I call her Sugar. I have a cat named Snowflake. I'll never forget the time I got her. My dad and I were driving in the car hoping that there were still some kittens left. Then all of a sudden the big white building came into view. I started screaming with delight! We got out of the car and raced up the steps. Then this lady showed us around the room. All I could see were BIG cats. I started to get nervous thinking, "I want a kitten, so where are they?" Then we went into the kitchen and there was a cat who lived on the refrigorator! Then she took us into a bedrom and she walked over to a blue box. The blue part of the box was a sheet, and the kittens were inside a cage! I held the boy kittens (there were 2 of them) and they licked me! But the girl kitten bit me! But even if she bit me, she was the one I wanted most! And I named her Snowflake. I also had another cat I loved (she died). I had her all my life until I was 9. Her name was Edwina. My cat's name is Dimbo. It is stupid and fat as a building and pees all day. Huggles and Oreo are dear kittens... and hunters! him, and then in an unguarded moment he lost it to Oreo again� poor little mouse! The bullfrogs in our backyard pond came out of hibernation and found they can no longer sun themselves on the big rock in the sun. No... Oreo is right there, ready to pounce! The frogs hide among the water lilies with just their sad flat faces peeking out of the water. And still Oreo watches and tries to swat. Once he fell right in the pond! He came inside dripping. As soon as we dried him, he resumed his Frog Patrol. all over the yard, the little snake dangling from his face like a droopy moustache. When at last Oreo dropped it, the little snake wriggled into the ivy. up a tree, up a ladder... I think it went that-a-way!!! This morning a baby bird flew through our open front door and right into our kitchen! It thumped against the window again and again, trying to beat its way back to freedom. Huggles crouched on a kitchen chair, watching and waiting. I opened the window but the little bird fluttered the wrong way. I tried to guide it with a spatula, but it kept hopping over. Still Huggles watched and waited. Don't fly into the room, little bird! Here is the window! Finally it fluttered out and up into the sky. Huggles gave me a look that said, "Just you wait. I am ready for the next one." This afternoon Huggles caught a baby chipmunk! He picked it up and dropped it and picked it up again, playing with it, pawing it, his new toy. No, no! Not a baby chipmunk! I snatched Huggles away and put him in the house. The chipmunk hobbled into hiding. Huggles ended the evening with blood on his neck. Someone finally fought back! Another cat, no doubt. We heard yowling. who give tiny lick-kisses, who rub up for hugs? it's all part of the package! If you have a cat you should love for it and care for it. So if you have a cat or any animal please care for it and love it because it is just like you! If some how your animal gets sick take it to an animal hospital. I have a cat named Girly. I got her when we were living in a bus. One of our other cats, named Marissa, had kittens. When we went to an apartment, Marissa ran away. The other kittens either died or ran away. I am glad I still have Girly! My sister's cat does not catch mice but my cat does. My cat is called Puss because I never gave my cat a name, but my sister's cat's name is Boof because he sits around all day and he is fat. Once when I went to the pet shop, my brother was getting a lizard. But there was a bunch of kittens. I begged my mom if I could get a kitten, because my brother was getting a lizard. She finally said yes. I was so excited that I was getting my own kitten. 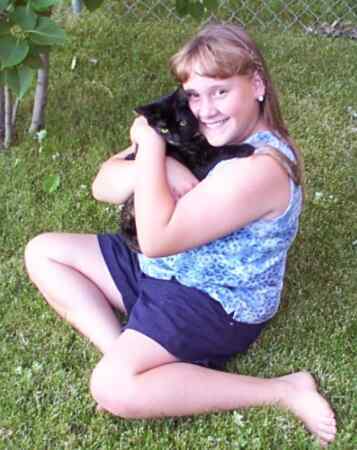 And my mom did say I could get a kitten for my 6th birthday. Right when I walked out of the store I decided to name my kitten Pepper. This year Pepper will be turning 3 years old on the 4th of July! I still love Pepper as much as I did when I walked out of the store. * I Have a Cute Kitty!!! Her name is Snowy because she is white. I love her. I love her. She is so cute!!!!!! I had a cat named Miming. She lives in the Philippines. She's really cute. She has black and white stripes. I really miss her, and I hope I could see her again. My cat is like all of these cats. He is orange with white stripes. He's very playful, but he ia afraid of every little thing. I got him from a friend for free. Once upon a time there once lived a cat named Snow White. All the cats liked her. She was the most beautiful cat you ever saw. She had the cutest white fur you ever saw. Then one day Snow White got hit by a car. A woman saw her then took her to the vet. The vet doctor said, "She will be all right, but are you her owner?" "So who is her owner?" "I don't know. I just found her lying down hurt and took her to you." "I need to know who is her owner, to tell them she's all right." "Since she doesn't have one, I'll take care of her." After Snow White got better, she went to go live with the nice old lady. My cat Diamond is just a kitten. She lives in the room upstairs right next to my room. She is brown with some black stripes. She has blue eyes and cute little ears. We bought her at a store in the U.S.A. If you have a cat or a dog or any animal, please love them and care for them because they are just like you!!!!!!!!!!!!!!!!!!!!!!!!!!!!!!!!!!!!!!!! This is the story of how I got my cat, Allie. I really wanted a cat of my very own so my family and I searched everywhere, but we could not find a kitten! 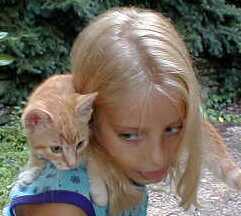 Then one day my mother came to school to pick me up and take me home, and in the front seat was a cat carrier. I asked my mom if we were taking Trump (my father's cat) to the vet and what was wrong with him. My mom said, "No, it is your new kitten!!!!!" I have a messy cat. He jumps on everything he sees. When he's bored he bites me, scratches the woodwork, or goes into a box. He scratches my poor dog and chews our flowers. But that's just the mean side of him! Hes a cute cat and we love him a lot! He sits like a human being and can say "Mom"!! I have a fat cat. She is really rolly. I call her Fat Fat but her real name is Chickie Babe. She is a babe when she is fat, really fat... I mean it! My cat is black and I love it because it is just like me. My cat's name is Simba. I left her in New Zealand. We couldn't bring her because bringing a pet costs too much, like 3000 dollars, so we left her behind with a friend. I have a hairy cat. He sheds a lot. I love the story "My Huge Cat" by Jamie. My first cat is so fat she looks like she swallowed a football. My second cat is 10% Asian Leopard 3 generations. But either way, I love them both!!!!!!!!!!!!!!!!!!!!!!!! My cat Molly had a bad past because her owner beat her up, so we bought Molly from the owner. She didn't have a name then, though, but she was quite scruffy, so I called her Molly, like a rag doll. I love my Snugglys. He likes water. That's my kitten Snugglys. I love my cat. But it does not live with me. It lives with my friend. and eats rabbits, birds, and moles. My mother found her at her work. She is all black and she's 4. My cat is called Leo, and he is a kitten about six months old. When he plays in the back garden with my sister and me, he is always killing birds!!!! I like cats a lot. They're very fun and snuggly. I don't have one, but I think they're cute. Well got to go, bye!!!!!!!!!!!!!!!!! Keep on smiling!!!!!!!!!!!!!!!!!!!! Pendleton Buffalo, New York, U.S. This is my cat Tiydie. She is 2 1/2 years old. She is my big baby!!! I love her very much. My cat Tiydie loves to watch birds. She is a tortoise shell cat and very friendly!!! Simba is like the feline king! He got his name from The Lion King. I love him sooo much! 'cause all my other cats died. I have a cat and a kitten named Simba and Key-Cat. They're my two snugglies! I love them more than any cats in the world! Little Torch Key, Florida, U.S. I have had Tiger for a long time from when he was a baby and he is still cute!!! My cat is called Bubbles. She is fluffy. Fluffy Bubbs is 63 in cat years, but she is very playful for her age. Sometimes when tomcats call to play, Bubbles gets mad and jumps on them from the fence. She sleeps a lot inside my house and outside. And she always needs feeding. If she feels unwell she eats grass. I must go. I think she may want some food now. If I don't feed her, she tickles my ankles or pats my toes. I love my pets. My pets' names are Boboy, Mew, and Boy. They like to play in the garden. They love to catch mice. They do not like to fight. Once I was walking along and I saw a cat. It looked sick so I took it to my doctor. It had kittens. One day a smart cat was outside walking and hit her head on a trash can. She went around saying, "You're dumb." When she said that to another smart cat, that cat hit her upside her head and she became smart again. Man, what a smatr and dumb cat was she. One day we decided to play a game with the flashlight. We turned all the lights off and began to play when my cat Snowball came in and decided to play with us too. So he started to chase the light around and around like a crazy person. Finally we had enough laughing for one night so we went to bed. I have a cat. His name is Snuggles. He is gray and white. On the side of him he has a heart shape in gray. I love him a lot! Mouzer is my tabby-calico kitten. 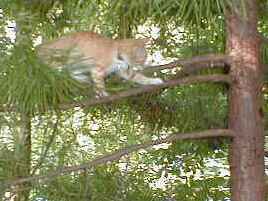 She likes to climb very tall trees! (She is usually being chased by my puppy, Puzzle!) Even though they are best friends, Puzzle enjoys chewing on Mouzer's neck, legs and tail. The kitten has been known to make a sneak attack on the puppy when Puzzle is not looking! I love my precious kitten. One day I said to my mom, "Can I please have a kitten?" My mom said "Sure, we'll go now." So we drove to a pet store. The guy at the counter said to go to a man's house. We went there and there was no one there! I said that the guy sent us on a wild goose chase. The next day we went to another pet store and there were 2 kittens. I wanted a girl, but the girl was frisky! Snuggles was a boy but very cute! The next day I went to day care. When my mom came to pick me up she brought Snuggles in, and every kid in my class held him! That's the story of how I got Snuggles! My cat's name is Pickle. He likes to run. A lot. He is a Siamese. I have 2 cats, both short-hair tuxedos. Tipperoni is 1 year old, and my second cat, Mouser, is 5 years old. 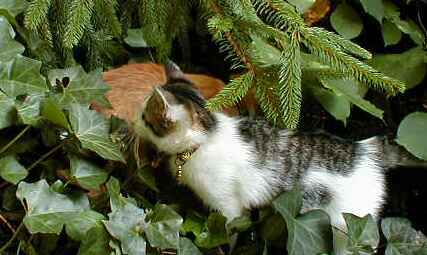 Kittens like to pounce at leaves. They pull down curtains and sit on window sills. They make big messes sometimes!!!! My Grandma and Grandpa have a cat named George. I call him a vampire cat because every time someone picks him up he starts to act like the Energizer Bunny. He never stops biting and scratching. When I grow up I want to be a veterinarian to help cats. Margo is grey. Her coat is soft and fluffy. My dogs Lily and Molly love to chase her a lot. She is one year old (in cat years). I love Margo so much. I love my cats, but man are they WILD! They love bags and shoes. Their names are Jake and Emily. Now you're probably thinking these are human names. But their names suit their attitude. And no, they are not real tigers, they are tabbies... although when they eat and play they are tigers. But on the other hand when they sleep they are kitten angels. And when I eat, they jump on me and try to eat my food! But I love them so much! And the thing I love most is they cuddle and watch TV with me. When Gorgey was a kitten she liked to slap Tobie, then she would run away. Tobie got up to find her but never did. She just got slapped again. Zip is a chief hunter. He kills baby rabbits, mice, and lizards. Cleo was a house kind of cat and overweight. She died. Misty is a tiny kitten and very playful. She is so silly!!!! Santa Fe, New Mexico, U.S.
Hi, my name is Cat. I live in a shoe, do you? One day I was walking down the street. Then I saw Dog. Hhe is my friend. He had a yoyo. I got a yoyo. We played with them for a long time. I had a cat named Gino that was my buddy. He would always sleep with me at night and follow me around the house. He was a sweetie. About 2-3 years ago Gino died of heart worms. He had about a thousand of them and it was too late. I remember the first time I got him. I was with my mom on a lake and she asked if I had a cat what I would name him. I don't remember what I said but all I know is that before I knew it she said she had a surprise for me when we got home. When we got home there was paper mache forming a line for me to follow from the door to my bedroom. When I opened up my bedroom door there was Gino crying for me. I used to have neighbors and one of their cats had a litter. Gino was the cat I wanted but thought I would never get. 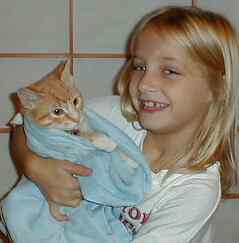 Gino was my baby and I will never forget him. Now I have 3 other crazy cats! Sammy always has time to play. But she hates when I go to sleep. So she decides to sleep with me. She is a lovable cat who is there as soon as her food is ready. She also is there when you need her (most of the time you don't need her but...) LOL! I love my cat Sammy! My mama kitty had kittens. That's how she got her name, Mama Kitty. She had 3 kittens - Gray, Blake, and Calico. I love them. Once my brother was feeding our cats. When he looked behind the dish he saw an opossum! It scared him and he ran to tell my mom. The opossum was eating my cat's food. We scared him off and hope he doesn't come back. My cats are happy now. The opossum almost looked like a cat. One day I was riding my bike. I saw something in the bushes. I came a little closer and I saw a cat. It was pouncing around like a tiger. That's why I call him Tiger! My cat Sassy when she sits on you, she purrs and dribbles all over you! My cat is named Tabby because it is a kind of a tabby cat. She is very cute and I love her. She is my favorite out of forty kittens. Some others are named Pumpkin, Myron, Butch, and Hero. Hero is white and black. Pumpkin is orange and so is Butch. Myron is all white and very soft. I love them all but Tabby is my favorite. I call her that because she likes chocolate and she is brown in colour. She is 9 months old and plays a lot. Kitty ONLY plays with strings, balls and bells. I like her a lot. My cat is nice. Sometimes he can be mean. Most of the time he eats and lays down or goes outside. My cat's name is Maxwell. I love him very much. One time I was walking up my street and saw a cat sleeping under a tree. I named her Mimi. She was so cute. She had orange and white striped fur. She spent the whole afternoon licking her paws. I gave her some cat food then brushed her fur. I knew she belonged to somebody because she had a red and purple collar on. It didn't have a name on it so I left her there. If she would have had a name on her collar then I would have told my mom and dad, but she didn't have a tag so I left her there because someone was probably looking for her and searching around where they lost her. Once upon a time I was taking a walk. I found a scrawny cat when I was just leaving my house. I watched him for a minute and saw him stalking a bird. He reminded me of a Japanese samurai as he pounced on his prey. After he ate, he came up to me and meowed. I stroked his fur and he purred. I asked my mom if I could keep him and she said yes. I named him Musashi after a famous Japanese samurai. I was at a friend's sleepover. My mom let Rosie out for some fresh air. She's not supposed to go out. My mom went back inside for a minute. When she came back out Rosie was gone. Turns out Rosie was in my neighbor's shed! Hi, my name is Stephanie. I wish I had a cat. I love cats. It is fun to have cats. There is a lady that has a lot of cats. The only thing I want is a cat. I only have a dog. But it is fun to a dog. I have a toy cat. It is a tiger. My brother's friend has a cat and the cat had kittens. They also have a dog that is outside. My dog is a boy. My brother's friend is the sister of my dog. They had puppyies. The kittens and the puppies are cute when they are born. I love cats, dogs, puppies and kittens. They are cute. One day Tiger and I were in my new home and we were happy together just kicking back. Tiger was playing with his rubber band and running around just playing so we just started to have fun together. He got me a couple of times and we started to feel like we were best friends. But then Tiger wanted to take a break from playing, so we did. A couple of hours later he decided to scare me by jumping on my back and playing with my hair, but I told him if he started to bite me he would be finished, and he didn't bite me so we all had fun together. I love my cat and he loves me. My mom loves him too. But Tiger loves both of us with all his heart. He started as a scared cat but I got him out of it and now he loves to play all the time. He is now 2 years of age and lovable as always. Yep, that is my cat. He is a yellow and white tabby. He has yellow eyes and knows when something is wrong - he will come tell you there is something wrong and he will not stop until you let him know that you know there is something. He is my smart baby boy. I love him a lot and he is going to be happy with his new home. Yep, my baby is the smartest cat around. meow, meow, meow, meow, meow He says good bye and have a good day. I have a cat named Binxy. He is black with a white spot on his chest. We named him after the black cat called Zachary Binx in the movie "Hocus Pocus." Binxy is an outdoor cat, but he hates to get his paws wet, so he hates going outside in the rain or snow. When Binxy was a kitten he was a stray with his sister. My mom found him in the middle of winter. His sister died at the vet where my mom took them both. We got to keep Binxy, but to this day he has an incurable cold and he's always sneezing!! Once I went to Pet Mania, and I went to my favorite place in the store, where the cute kittens are. I went over to a little kitty and put my hand out. To my surprise, the kitten gave me a high-five!!! Now I want it because it is calm and as an "added bonus" the kitty gives high-fives. My name is Husna. I have 4 cats. Actually I have 1 but my cat just put out 3 cats. The mother of the cats is called Cici. 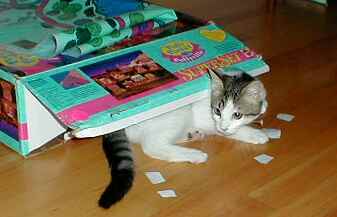 The first cat who got out was Leonardo. The second cat who got out was Picasso, and the third cat who got out was Sir Arthur Conan. 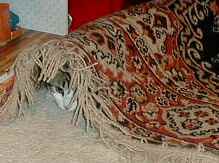 I hope you all will love your very loved cat.!!!!!!!!!!!!!!!!! THANK YOU! 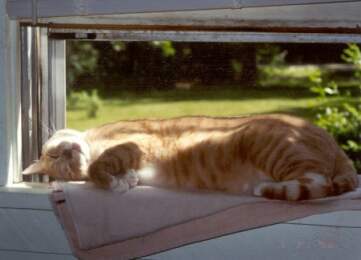 My cat Tiger was an outside cat and he was my favorite cat and only cat. He was my dad's favorite. He died of a wild animal. The next day we found him beside the house. Then we buried him. One day I was playing basketball in my driveway when this beautiful smoky gray cat came out of the woods. She looked real hungry so I went inside to ask my mom if I could give her some food. At first she said no because she did not want her around, but I begged. She finally said yes, so I gave her some food. After I put it outside I came back in and asked if I could give her some water, and my mom said yes. Then she said that she wanted to see the cat, so she went outside to see her. When she saw the cat she said, "Rachel, that cat is going to have babies." And she did. We kept the cat, named her Smokey, and two weeks later she had kittens. 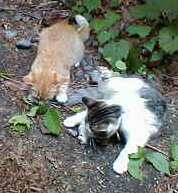 Smokey hid them in the woods so every day my mom, brother, and I would look for them. One day after school we were looking for them and suddenly my brother yelled to my mom and me. We rushed over and saw four cute little kittens. We named them Runts (he was the runt of the litter), Blue, Stripes, and Blackie. We played with them a lot so Smokey kept moving their home. The next time we found them we saw that Runts had died. We were all very sad. A few weeks later we gave the kittens away to our friends and gave Smokey to my aunt. Smokey still lives with my aunt and is still mine. I see her every time I go to my aunt's house. I love her very much. My cat named Nikki was born on a farm in Winnie, Texas. He is very sweet. He is black with a white spot on his neck. I love him so very much. He loves me too, because he follows me all around the house. He was the runt of the litter. He has three sisters and no brothers. One of his sisters lives with me. Her name is Fluffy. I have a cat, and when she was little she could fit in the palm of your hand. We got a little collar for her. It has a bell on it. When she walks or shakes her head, the bell jingles. My cat got along with my friend's dog Patsy until my friend's dog died. Someday in August I got my baby, Lulu. She is my favorite kitten. I have two. I wish the UPS guy didn't run my Dude over (kitten, 1 year). She had kittens. Two died - Peaches and Cream. And Shadow. But at last I got Lulu. She was thrown in a dumpster and hurt. My cat Frank is a Snowshoe. I don't know if you know what that means. I don't either. I think they said it was a Siamese and white cat. He is sweet and loves to tease my dog, Sadie, by rubbing against her, and when Sadie tries to move Frank hisses at her. Poor Sadie! mailroom *We hope you'll send in a pet story, too! You can send it in an e-mail message (click the envelope to go to the mailroom) or use the form below. Visit our other animal stories. Visit our math story problems. Back to the top of our cat tales. Visit our number stories. © copyright 2002 - by Wendy Petti of Math Cats. All Rights Reserved.